Tips to make all of your Tetriminos, err clothes fit the best way possible! Traveling is the best. You see new places, meet people, and enjoy all sorts of interesting activities. Zip-lining for the win! The biggest point of stress? The flight! We could go on about battling for elbow room (especially in the middle seat), but we feel bad vibes several hours before ever setting foot in the airport. It starts back home as we attempt to cram belongings into a bag or two, then attempt to get those bags safely from one destination to the next. To make matters worse, the return trip home can be an even bigger pain, as we fit not only the original items into the suitcase, but also souvenirs. The result? We sit on the suitcase to shove everything inside, and pray the zipper doesn’t break. By the time we check into the hotel, we’re afraid to open the luggage for fear of a clothing explosion! Thankfully, we became much better at packing, thanks to Tetris! The goal is to avoid overpacking while ensuring that you don’t under pack and leave something important behind. So before you open the empty suitcase, we suggest making a list ahead of time, preferably a week or at least a few days before the trip. This will give you time to make the list as comprehensive as possible. When it’s time to pack, drag out the suitcases and set them down on the floor with the lids open. What do you see? For us, the inside of our luggage makes us think of a blank Matrix in Tetris. The Tetriminos? The items we’re about to pack! For us, this is the fun part. All of a sudden, the stress recedes and we make a game out of packing. It’s a good idea to separate your clothing, toiletries, and miscellaneous items from each other. They’re each like a Tetrimino, each with their own respective place inside of your suitcase. Start with clothing, since these are the easiest things to fold. 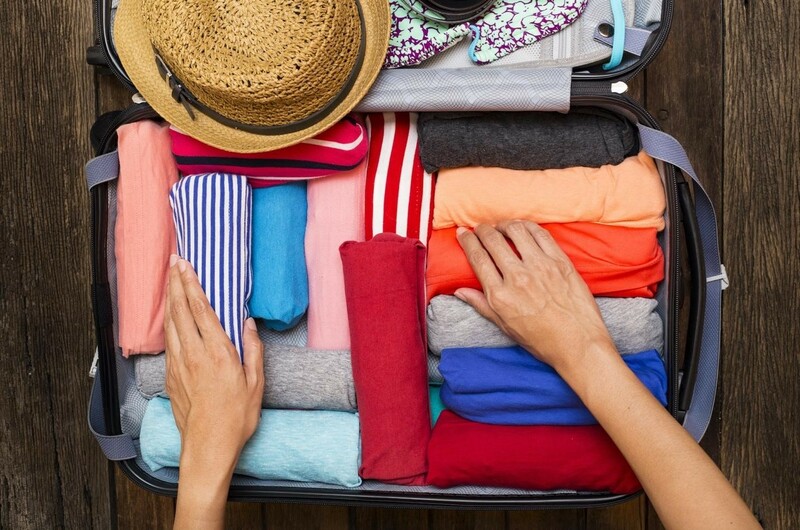 Multiple packing strategies exist, but we prefer to roll everything into tight cylinder shapes, place them all on one side of the suitcase and then work our way across, making sure to create even layers of clothing. Yes, you will get wrinkles, but wrinkles are inevitable when it comes to traveling. Next, look over your remaining items and sort large and also odd shapes. Now comes the trickiest part. First up, shoes. You don’t want dirty soles to touch your clean clothes, even if you cover the shoes in a plastic bag. To avoid this, have the soles face away from each other, creating a little shoe rectangle. Now they’re in a better shape, which lets you position them accordingly. Additionally, leave side pockets and other storage areas empty, since these are great spots to store those souvenirs; that said, you should put toiletries in there to mitigate spills. We’ve definitely been there. To neatly arrange these things, purchase a travel kit or go with Ziploc freezer bags, but don’t haphazardly toss things inside. Similar to Tetris, think about the best way to make things fit; tubes (think toothpaste and hair gel) go side-by-side, for example. Providing you took the time to neatly arrange everything and didn’t over pack so that it’s impossible to close the suitcase, you should be ready to travel! The best part? Because you took the time to pack the right way, it’ll be easy to unpack and quickly hit the beach, or wherever you chose to visit. Happy vacationing!